On Friday, my mum, Benjamin and I headed off on a bit of an adventure. 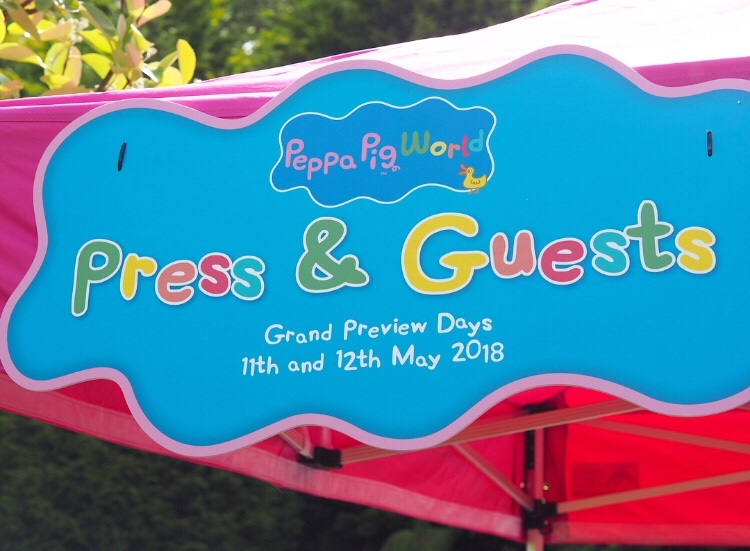 Two new rides are opening in Peppa Pig World at Paultons Park this week, and I had been invited along to the press launch by Liz Lean PR. Although I have been blogging for seven years, it’s only recently that I have taken my writing full time and I haven’t been to a lot of events of this scale, so I was very excited to be involved. I would have loved to have taken Carly along, but she was at school. Still, it was nice to focus our attention on Benjamin, and he had a fantastic time. Paultons Park is only around 40 minutes away by car for us, so we went straight on from the school run, and arrived as the new rides were being unveiled in the special VIP area of the park. We were given a goody bag, had some complimentary refreshments and Benjamin was given a lovely little pink cake before we went on the Queen’s Flying Coach ride. Benjamin was a little unsure to start with, but ended up really enjoying himself, looking all around as we were transported around the monorail track high above the rest of the park. From our vantage point we were able to see the other rides. I found the narrative really fun on this ride – the queen was very posh! Getting off the ride, we saw Peppa and her family posing for photos. Benjamin was a little unsure of the characters, so we stood at a distance. Rochelle and Marvin Humes were at the event, and after getting a little starstruck, I plucked up the confidence to ask them for a selfie. They were really down to earth and lovely about it, despite me acting like a bit of a fan girl (so didn’t play it cool). Next it was time for the second new ride – Grampy Rabbit’s Sailing Club, which I was looking forward to as I love a good boat ride. Unfortunately Benjamin had other ideas and tried to escape overboard several times, meaning the tranquil cruise was less enjoyable than it should have been as my mum and I frantically scrambled to get him sitting down on the seat. The new area of the park also has a themed food station – The Queen’s Kitchen, which looked lovely. Afterwards we headed back into Peppa Pig World to go on some of the other rides. Benjamin absolutely loved Daddy Pig’s Car Ride, he was in his element spinning the steering wheel round and round! We also managed to visit the Little Africa area, which wasn’t there last time I went to the park, and a few of the other rides in the main Paultons Park. We had to rush away to get back in time for the school run, but we managed one last ride on The Dinosaur Tour Company, which was great fun until it sprayed water directly at our cameras – make sure you watch out for this if you go on! We had a fantastic day and really enjoyed getting to experience the new rides in advance. Peppa Pig World has been a firm favourite for Carly, and now Benjamin has started watching the tv show, I’m sure we will be back soon! I was invited along to the exclusive press launch at Peppa Pig World in Paultons Park by Liz Lean PR. All words and photos are my own.